The Osaka University Graduate School of Medicine, Department of Anesthesia is devoted to the training of learning physicians to become distinguished anesthesiologists. We believe that our training program provides the ideal environment for developing knowledge and skills essential to providing the safest possible care for their patients. We are committed to meeting the aspirations of our enrollees whether they seek careers in academic research or in individual clinical practice in our specialty. We appreciate your interest in our department and encourage you to contact us with any questions you may have. Sho C. Shibata M.D., Ph.D. 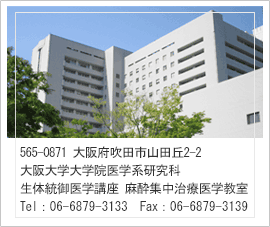 Copyright © 大阪大学医学部　麻酔・集中治療医学講座 All Rights Reserved.